In recent years there has been a growing dissatisfaction with standard economic theorising which has fostered the development of alternative ways of understanding how economies actually work. Too often though these approaches have been developed in isolation, or even in opposition to each other. 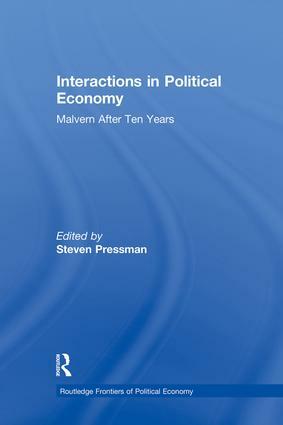 However, Interactions in Political Economy, demonstrates that the different heterodox approaches to economics have much to learn from each other. Economists working within different paradigms, including Post Keynesian, Marxism and Neo-Ricardian economics address a wide range of issues in methodology, the history of economics, theory and policy. The result is a wealth of insight into how economics ought to be done, how various theoretical approaches dovetail, and the efficiency of various approaches to economic theory. The volume reflects the diversity and quality of the annual Great Malvern Political Economy. Contributors include some of the leading names in heterodox economics John Cornwall, Paul Davidson, Kevin Hoover, Philip Mirowski and Ed Nell.